At 80, Robert Solem is well into his fourth quarter in the game of life. A grueling quarter, hard to move the ball and the defense stacked against you to take away your best plays. His boyhood hometowns were Minneapolis and Kansas City. After graduating from high school, he left for the coasts never to return. As an undergraduate, he attended M.I.T. and Tulane. He taught at a small college before migrating west for four years of graduate studies at the University of California, San Francisco. He graduated with a Ph.D. in gerontology, in 1973. There followed two years at the University of Washington and six years as research director of the Community Based Care Project, a federal grant administered through the Washington State Department of Social and Health Services. Shunning permanent employment with the state, he spent several years living on his sailboat, working part time, and sailing the inland waters of Puget Sound and British Columbia. He couldn’t have asked for a better mid-life crisis. Early in 1985, he began his most satisfying career experience as the administrator of a non-profit continuing care retirement community. After 22 years, he retired from that position in 2007, age 68. To that point, his only writing consisted of reports of various kinds plus a forgettable children’s story written while at sea. He moved to Arizona in the fall of that year, where he met the partner of his retirement years at a singles golfing event. They now live in Tucson Estates, an adult age-restricted community of manufactured homes, when they’re not traveling. Although the desert is now his home, sailing is still his passion, even though mainly relegated to memories. 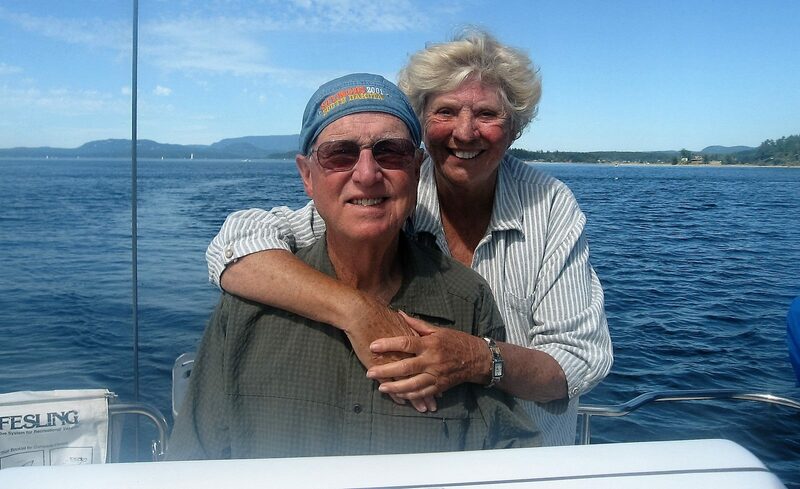 Last summer the pair did undertake a one-week bareboat charter, just the two of them alone on a Beneteau 32 out of Nanaimo BC. Their friends were convinced they’d lost their marbles to the desert sun. Maybe a last hurrah, maybe not. In his early seventies, Robert began writing fiction as a way of keeping the mental cobwebs at bay. His first novel, a kind of bucket list undertaking, dealt with the theme of “loss and healing” and has long since gone the way of the delete button. He followed with a crime fiction novel that has now expanded into a series at about one book per year. The main protagonists are a quartet of Harley-riding free spirits, early sixties and counting backwards, who call themselves the Merry Marauders. They were roped into becoming private investigators by the FBI brother of one of the four. The author has peopled their fictional world with a variety of lady friends, siblings and offspring, lawyers, cops, and mentors. His books are not intended to be pure crime thrillers. No building up of tension to an unbearable level. He sees his strengths as a set of engaging characters, spirited dialogue, humor, and an interesting if not nail-biting story. When younger, he rode a cross-bike. Neither fish nor fowl, it was a combo street, trail and racing bike. Like his books, some crime, some romance, and a small dose of thriller. Either the best or the worst of several worlds. Up to the reader to decide. He is currently in the process of dressing his offspring in shiny new Kindle covers and furthering their development with a professionally-directed edit and revision of each. Knock on wood, he keeps healthy and relatively pain free through diet, cardio, good friends, positive thoughts, a little wine with dinner and most evenings, a vodka martini at five.